I’m sure 99% of you have noticed with the new format that the Journal is defined more by a title than the date. I really liked this idea, but also was afraid of the times where I would struggle to come up with a title. I suppose some days it will be the big story up here in the Keweenaw and at others, smaller stories about our lives, or even how I am feeling. Obviously, this issues title was based on how I am feeling. I suppose everyone feels this way most of their lives, only with different levels of both. I have SO MUCH to be thankful for, not just today, or this past week, but in the past 50 years and 167 days. Sure there have been days that were a much larger challenge to find something to be thankful for, but as I age, it seems to be able to come to me more easily. For some reason, in the past few weeks, it seems like it is almost automatic. I just take a look around and see how wonderful my life is. I have a beautiful wife that loves me unconditionally, a beautiful daughter that also loves me unconditionally, two dogs that do as well and my love for them is also unconditional. I live in the place that sits at the top of my list of places to want to live, have a job that I love to do- even after 25+ years of doing it. I am not financially wealthy, but I also do not have financial woes. There are hiccups in my health on a daily, weekly, monthly, even yearly basis, but I’m still here to claim victory over all of them. I guess I can say with all honesty that Life is Good. Sometimes I am a little worried to say such things, as it seems like not long after, the powers that be take me down a path that presents challenges I did not ask or wish for… but that is life. We were never promised that it would be easy, or if we were, it was a lie. However, I have found that through the years, the less I fight to try and get off that path of challenge and the more I just go along for the ride, the easier it becomes to go down it and the more I am able to recognize the moments of enjoyment that have been given to me. We humans can be control freaks and I used to take it to a professional level, but have learned to just let it be. What I thought was best for me was not the case and I was no where close to being as smart as I thought. My comfort used to come from thinking I was in control, now, there is nothing more liberating than recognizing and admitting that I am wrong. Although I am still having to work on that!!! Where am I going with this? Well, it is the second part of the title that I have left off. It is that I am not anxious. Anxious for what? SNOW! Now don’t get me wrong, I have not lost my love of snow. Probably not even by a bit. I would be lying if I said that I did not wish that we were starring down the barrel of a major winter storm this week that would set us up in great shape for the start of the snow-play season. However, I am fine with the current forecast that calls for rain on Monday and the first half of Tuesday that will melt the last of our existing snow off and make everything muddy before the cooler temps arrive midweek and change the precip over to some snow and start freezing things back up. It is highly doubtful that there will be enough snow for the opener on Thursday, but that’s OK. I suppose it helps knowing that I live in an area where snow…and a lot of it…are a certainty. It is just how much the “a lot” becomes. Will it be 12 feet (a record low), 20 feet (our average) or 30 feet+ (record territory). In either case, we will not be hurting for it sooner or later. So enough of the philosophy! It was a pretty busy first half of the week. 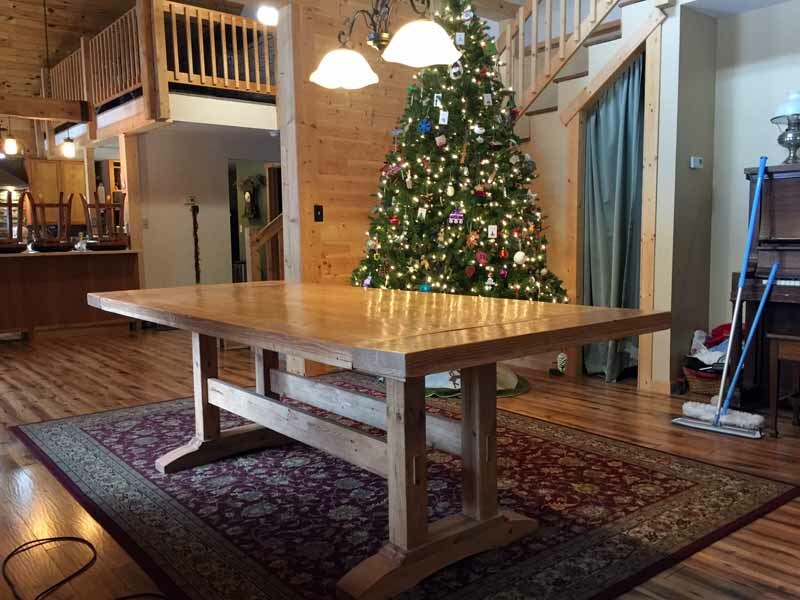 While the dining room table was nearly done at the start of the week, it was not completely done and the deadline was Thursday morning. I am usually OK with deadlines, but when it comes to wood working, I would prefer not to have a strict deadline. It adds an element of pressure and thus worry/concern and that takes some of the fun out of it. I did have a blast in the woodshop building the table, but when combined with still trying to finish crossing the T’s and dotting the I’s on the website remodel, plus all of the other things that are on my plate on a daily basis, there were times when I felt more forced to go and do the work, than go into the shop for the pure pleasure of it. I did meet my deadline and by around 10 am Thanksgiving morning, my brother and I were hauling it in from the shop and getting it set up in the dining room. I am pleased with how it turned out and more importantly, so was Nora. 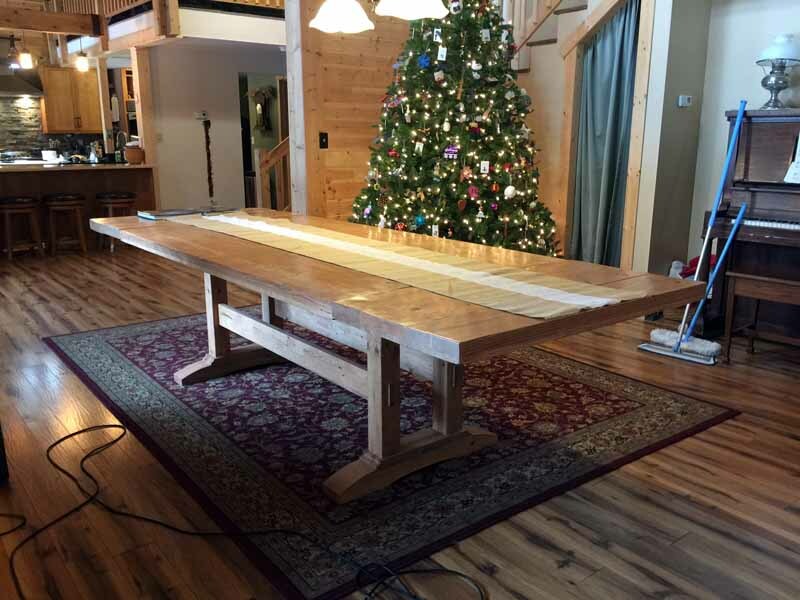 Here is a shot of the table with both leaf extensions in it. It was a joy to have our entire cast of guests sitting at the table and not have some have to sit elsewhere. Its fun to think of all the future get-together’s will be had at that table in the years to come. It is a welcome addition to our home and family! Thanksgiving itself was wonderful. 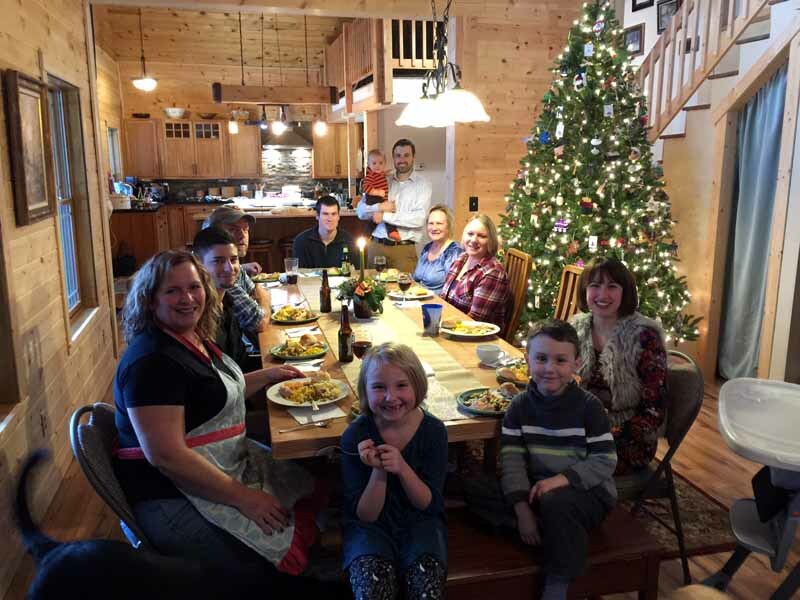 We had a mix of friends and family over and there were 12 of us around the table for supper. The feast was pretty traditional, with turkey and all the fixings, but that is probably where the traditions stopped. We did not have any football games on, most of us sat around and visited, either in one big group, or as was the case later in the evening, in smaller groups. 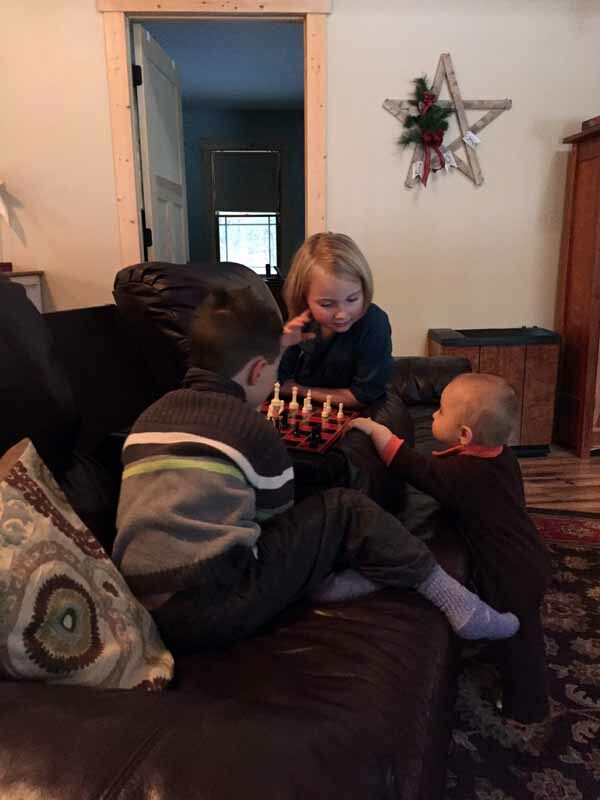 Gracie and her buddy Jacob played a game of chess, while Jacobs little brother made sure no cheating went on. Backing up a bit, the day before Thanksgiving, we picked up a couple of inches of snow. 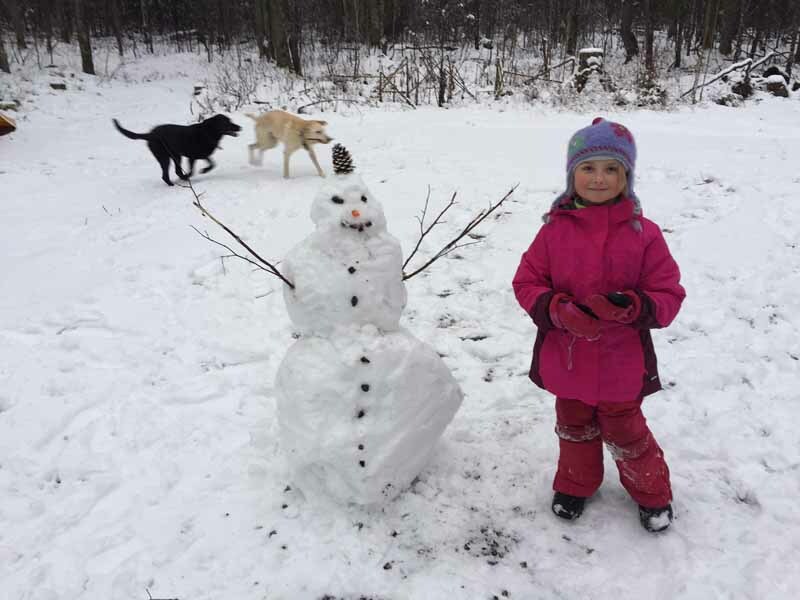 It was wet and sticky and also enough for Gracie to build a snowman. I helped a bit by rolling the base until it got big enough and was in a good spot to finish him off. Then Gracie did the rest, including all the finishing touches and it turned out great. Wednesday night into Thursday morning we had a mix of rain and snow fall. 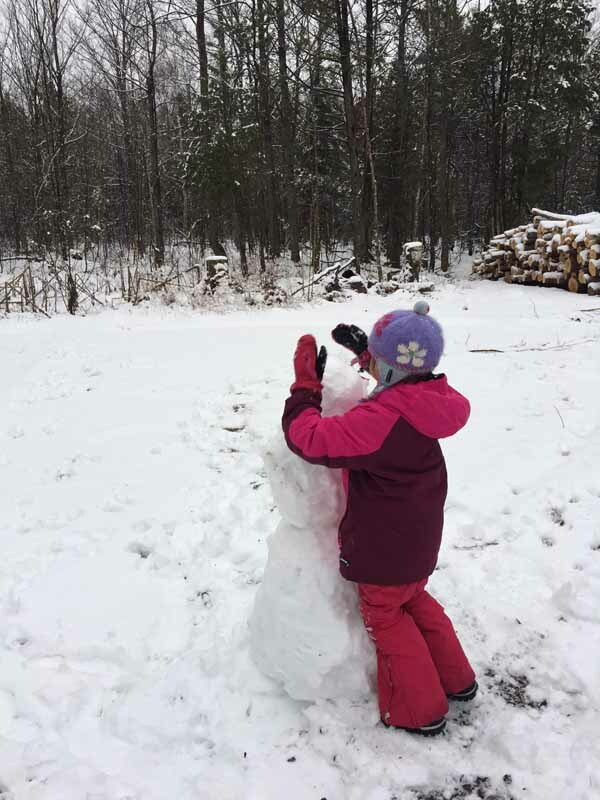 The higher terrain of Keweenaw County saw mostly snow and had as much as 6″ on the ground Thanksgiving morning. We sort of held steady and then have lost most of our snow with temps in the mid 30’s the past 3 days. 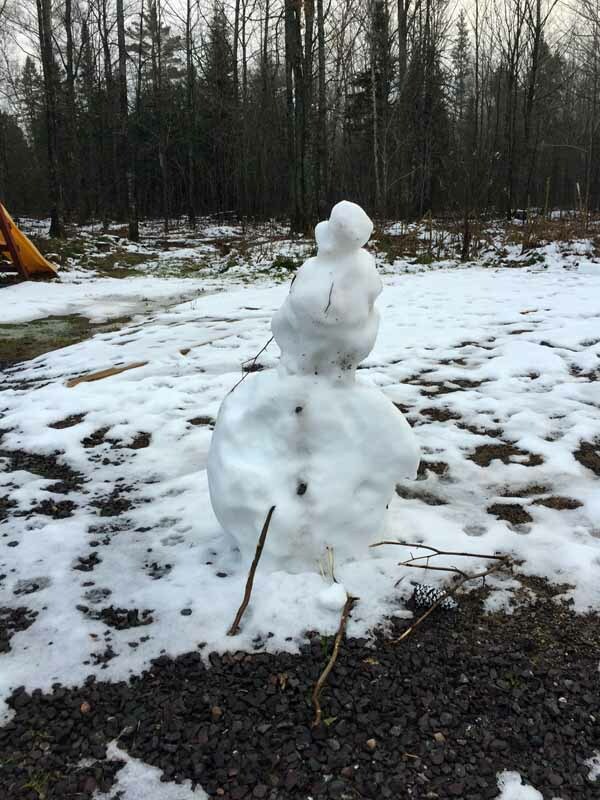 Gracie’s snowman has lost some weight and a few other things, but has not given up the fight. Friday, Gracie was invited to a skating session at the Coliseum in Calumet. One of her friends takes lessons there and that session was an “invite a friend” one. So Gracie laced up the skates and got ready to hit the ice. Both Nora and I were wondering how it would go. Gracie has been getting a little “soft” in the past few weeks/month. Meaning she seems to break into tears at times that she did not previously and probably could get by without. We have been working on trying to get her to not cry, while still respecting her feelings. 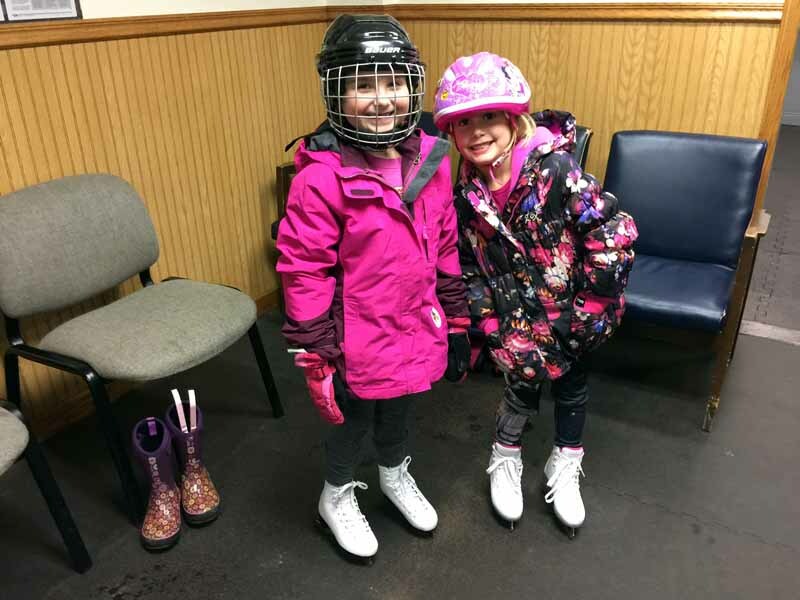 Anyway, the last time she skated was at the outdoor rink in Ahmeek and she took a spill that did warrant some tears, falling and hitting her face on the ice. We were fortunate enough to receive a bunch of hockey equipment from a visitor to the site and so we made sure she had the helmet on when she went out onto the ice this latest time. At first, she was pretty timid. I think she was a bit worried about taking a spill and hitting her face/head again. After a few tumbles, it became clear to her that her helmet and face shield would protect her in those areas very well and she started getting more adventurous. 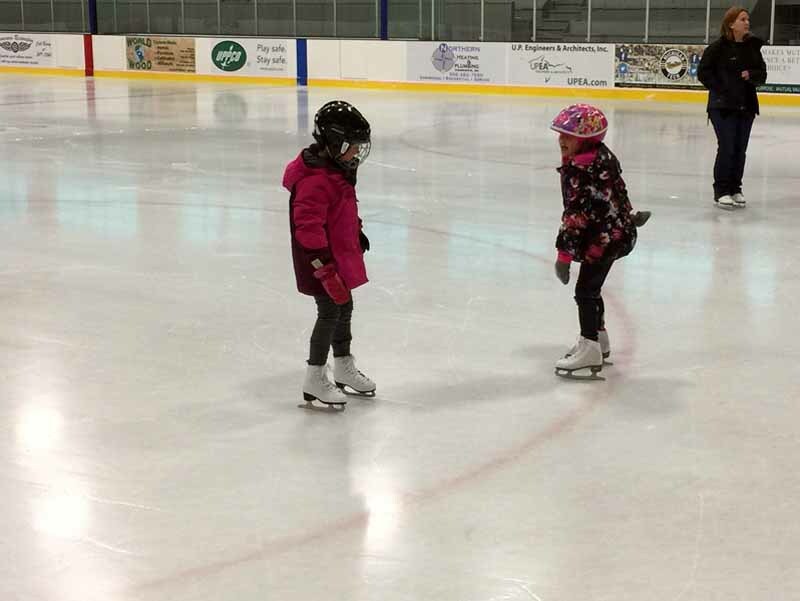 I really thought she would not last much longer than 30-45 minutes before the toll of falls and being skates for the first time all season would kick in and have her toss in the towel. I was wrong. She ended up staying on the ice for around an hour and 20 minutes and would have gone longer, but her friend took a quick break and we decided to call it and have some dinner. So here we are…three days from the opener. Its been a slow start to the winter season up here so far. Someone asked me the other day what I thought the winter would bring and I said I was a little worried that it may end up being a fairly mild one, as winters that follow a mild November up here tend to be mild. I also said that it may just kick in shortly and have everyone on their knees begging for mercy by the middle of March. Only time will tell and I am ready for the ride!